David Tudor, Fred Waldhauer, right, with Tudor's bandoneon at a Berkeley Heights School rehearsal, Berkeley Heights (New Jersey, United States), c. 1965. Photo Franny Breer. 9 Evenings: Theatre and Engineering, Pontus Hultén and Frank Königsberg eds. ([New York]: Experiments in Art and Technology: The Foundation for Contemporary Performance Arts, ). At the time 9 Evenings took place, David Tudor was known mainly as a pianist and, more particularly, as an interpreter of the works of John Cage, with whom he had been collaborating since the early 1950s. Starting with Fluorescent Sound in 1964, Tudor embarked upon the path of composition. Bandoneon! (a combine), one of his very first compositions, combined three main elements: a bandoneon, this coupled with an electronic device, and a linking of sound and image. These elements were also present in works prior to Bandoneon! (written by other composers and played by Tudor), where one can read the premises of the piece devised for 9 Evenings. Other composers also wrote bandoneon pieces that Tudor interpreted. In 1964, for example, he played with Pauline Oliveros, the composer of Duo for Accordion and Bandoneon with Possible Mynah Bird Obligato. And on August 6, 1966, in St Paul de Vence, he interpreted Gordon Mumma’s Mesa, originally composed for a Merce Cunningham dance piece entitled Place. In this work (2), the sound of the bandoneon played by Tudor was picked up by six microphones, processed through an electronic device (operated by Mumma) and played over four speakers. Mumma was already envisioning a configuration that would enable the electronic device to function automatically: “If these logic modules are operated in their fully automatic modes the most extreme performance situation for MESA is possible: a duo between the Bandoneonist and the electronic circuitry. Most often they are operated semi-automatically, with a second human performer making decisions and overriding parts of the internal logic. Usually this second performer is myself, the composer.” (3) This duo is indeed what Tudor would accomplish with Bandoneon! by adding an additional element to the image/sound link. Tudor also explored this association in another work, Lowell Cross’s Musica Instrumentalis, performed on May 13, 1966, at the Art Gallery of Toronto (4). Bandoneon music picked up by stereo microphones controlled the sweep of electron beams across modified black-and-white TV screens, in the process generating images. This system was refined by Cross as early as 1965, and was used in 9 Evenings. 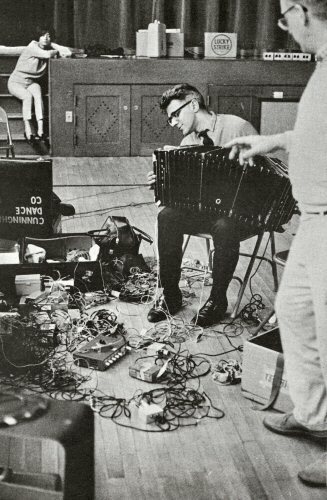 David Tudor put a traditional instrument (the bandoneon) on a circuit with an array of technological components.